Last week’s episode of The Walking Dead was about betrayals and reconciliations (read my episode synopsis and review here). This week’s theme looks to possibly double-down on at least one part of that, at least if the preview videos are anything to go by. Scroll down to view the videos and to get my best guesses on how Gimple and co. intend to set up the season finale, coming in just over a week’s time. This is kind of ambiguous. “Group” is the term generally used for all of the Alexandrians, but there is also a specific group heading out on a journey (more on this below). So, the question becomes, which group has a member making “a heartbreaking decision”? If it’s the group on the journey, that limits our possibilities; if the group overall, it could mean just about anything. The larger group is split up all over the place, with most in Alexandria, the one group heading to Oceanside, Maggie, Enid, and Daryl (or ishe) at the Hilltop, Eugene and (thanks to one of the photos AMC released for Episode 715) a still-alive Sasha are at Sanctuary, and Morgan & Carol are still, for the moment at least, at the Kingdom. The “group” could mean any one of these micro-groups. My personal belief is that it likely refers to the group heading to Oceanside. They’re not going to be an easy group to deal with, and Tara is likely going to be point. The heartbreaking decision might be that she’ll have to take someone’s life at the women’s colony, or that she makes a decision pertaining to the women there, and it leads to heartbreak for those women, or, indeed, a decision is made that leads to the loss of one or more of the Alexandrians. However, I don’t expect to see any deaths in this episode – those will likely be saved for next week’s Season Finale. We open on a shot of Daryl riding his bike beside the motor-home, Michonne driving and Rick in the passenger seat. A van driven by what might be Aaron or Tobin follows behind, Father Gabriel on the passenger side. Cut to the group walking through a forest, Tara in the lead with Aaron, Michonne, Karl, Tobin, Jesus and Rick all carrying machine guns. With them is Daryl with a box, and Enid and Father Gabriel behind him. “Watch for the signal,” Rick says in voice-over. Cut to Jesus and Gabriel walking out of a swampy area, then to Aaron and Eric (first time we’ve seen him in ages!) holding rifles and looking concerned, and then a shot of Enid, arms crossed, looking at Karl while we hear Michonne in voice-over ask, “What time does the clock start?” Rick replies, “As soon as she’s there,” and we see a bunch of them — Rick, Michonne, Aaron, Eric, Gabriel, and Tobin — in a rowboat. Cut to Rick looking up at Michonne as she starts to climb a tree. “You good?” he asks. “I’m good enough.” we jump to Oceanside, and see their daily routine rudely interrupted by a large explosion just behind the main cabins, followed by the women running. Cut to Negan, approaching the camera, while we hear him in voice-over, “This…could be the beginning.” Now to Hilltop, where Gregory is pretending to read a book while glaring at Maggie, and we hear one of his lines from the other video, “Why are you still here, Maggie? Where are your friends?” Note that this is a prime example of how the folks at AMC will mess with chronology to give us as little direct and solid information as possible in these previews — here, the questions are reversed from the order he actually asks them in. Then, we cut to the scene with the two of them outside the walls, as seen in the previous video. This time, however, the camera focuses in on his hand, holding a wickedly curved knife slightly concealed by his waist. To finish up, a quick montage: we go back to Oceanside, where some wonderfully detailed walkers (check out the barnacles covering the lead one!) are heading through the woods, as we see Michonne line up a shot; cut to Gregory looking guilty and angry as he peers into a vanity mirror; and Enid in the lead with Jesus, Rick, and others behind as they leave the vehicles we saw them in earlier. A lot of quick information for a 30-second video. There is definitely some misrepresentation going on here — but of course, this makes sense, because AMC hardly wants to give away the plot before the show airs. However, I feel it incumbent upon me to mention that on last week’s episode of Talking Dead, they showed the same scene as the Sneak Peek video, but it went about ten seconds longer. In that clip, Maggie asks Gregory to keep a lookout while she plants, and that is why he pulls his knife out. The way they show it in the montage here makes it appear much more menacing than it did in the full clip, but it is true that he kind of holds the knife partially hidden by his body. I don’t trust him for a second. As for the larger group, they’re obviously going to Oceanside en masse in order to make an impression — only if Oceanside believes that Rick and the gang are strong enough to take on Negan will they, possibly, agree to help. The inclusion of Tobin and Eric in the group intriuges me somewhat. Neither has been a main character, nor have they been on much this season. Could it be that we’re being set up for a low-stakes death heading into the season finale next week? Don’t be surprised if either one or both bite it Sunday night. But the biggest piece of information here is easy to miss at first glance. Daryl is with the group heading to Oceanside. This means that it is almost assuredly Dwight who Rosita saw outside Sanctuary at the end of last episode. That should make for a very interesting encounter! And finally we get this. 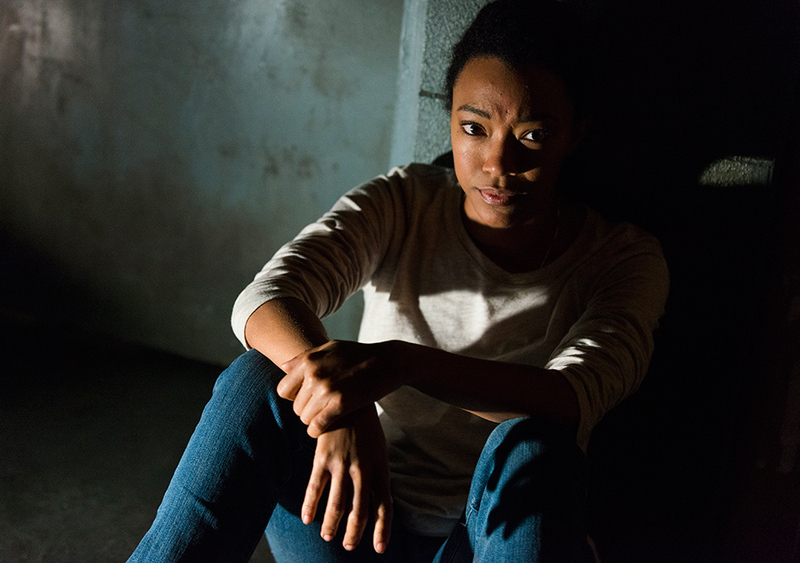 As an added bonus, the picture AMC released for this episode with Sasha, apparently in the Dipshit Training Room. So she survived her frontal assault on the Sanctuary, and apparently unharmed. The fact that we get a brief shot of Negan in the second video also means that she failed her primary objective. Things are about to get very interesting.